Bangkok, 25 January 2016 – Dusit Hotels and Resorts launches a new package to celebrate the bright and invigorating energy of the spring season. Valid now through 31 March 2016, guests booking the Spring Splendour package will enjoy sumptuous daily breakfast and the choice of one rejuvenating spa treatment or a 1288 THB* dining credit when staying 2 nights or more. 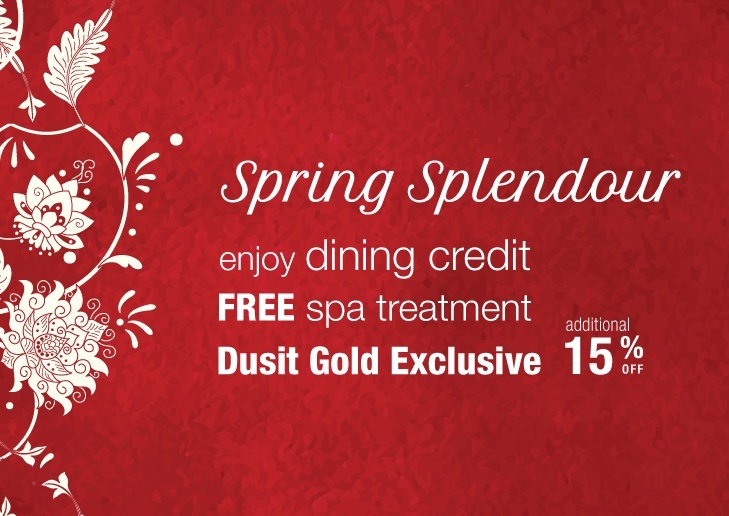 For more details on the Spring Splendour offer, please call +66 (0) 2636 3333 or visit http://www.dusit.com/specialoffers/spring-splendour. 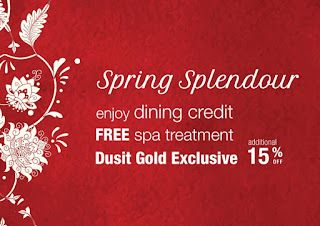 To sign up for the Dusit Gold loyalty programme, visit www.dusitgold.com. *Dining credit is valued at 1288 THB or equivalent in local currency. Other terms and conditions may apply.